Entertainment Weekly recently posted this article to commemorate the series as it embarks on its 25th season with Free Agents. The article discussed 25 of the greats Challenge moments and included commentary from Challenge alum such as: Beth, Darrell, The Miz, Rachel Robinson, Mark Long, Kenny, Johnny Bananas, Sarah, Landon, Susie, Cara Marie, Diem, Abram, Veronica, Frank, Paula, and of course CT. Commentary was also given by Jonathan Murray and TJ Lavin. It’s definitely an interesting read for Challenge fans, and the article did reveal some exciting news. 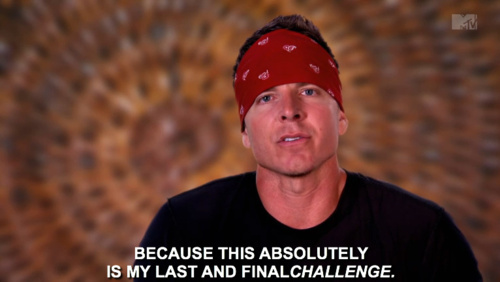 Once again, Mark has realized that his love for The Challenge hasn’t died. As of this article he is busting down the doors of The Challenge Retirement Home and hoping to return for another Challenge victory. Best of luck Mark, and it was great to hear from all of the Challenge alum! Oh man, some ed notes got some things wrong… skydiving in the Inferno II? Coral BROWN?